School programs at the Rundle’s Mission Historic Site teach students about the meeting of cultures. During the mid 1800s, people from different cultures met at the shores of Pigeon Lake. Today, new curriculum-based school programs teach students about the stories associated with this particular place and region, how the people here coped with and affected change and how this history is related to life in the region today. At least eleven children have been identified by name and age who lived on the north shore of Pigeon Lake during the years 1847-1875. Their parents were either indigenous to the area, fur traders, or missionaries. Meet some of these children and find out what their life was like. 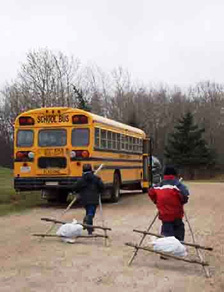 Toward Confederation – students will learn to appreciate the challenges of co-existence among peoples. The focus is on the little piece of land that is now the Rundle’s Mission Historic Site, where, in succession, Aboriginal people, missionaries, fur traders, and settlers lived. The time at which we will look is the mid 19th century. Through the exploration of questions about this piece of land, we will arrive at knowledge about the land and people in their wider context. Includes cartography, ecological regions, settlement patterns.